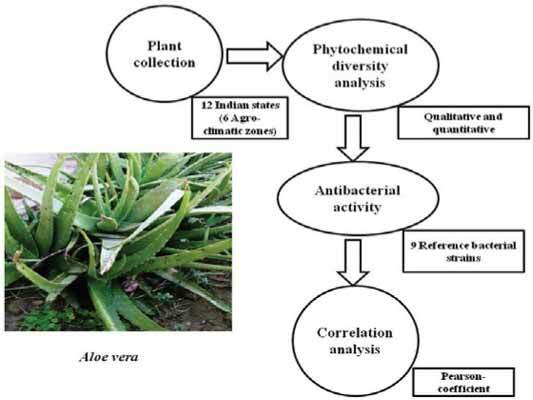 In this study Aloe vera accessions were collected from 12 states covering different climatic zones of India. The aqueous crude extracts were investigated for qualitative phytochemical diversity analysis, quantitative estimation of total phenol, alkaloid and flavonoid content and their antibacterial potential against ATCC (American Type Culture Collection) bacterial reference strains. Pearsoncoefficient correlation was used to correlate the quantitative estimation between tested bio-active compounds. Antibacterial potential was evaluated by agar well diffusion method against 9 bacterial reference ATCC strains. MIC (Minimum Inhibitory Concentration) values were calculated by microbroth dilution method. Different Aloe vera accessions showed the presence of alkaloids, glycosides, reducing sugar, phenolic compounds, flavonoids and tannins. Significant correlation was observed between alkaloids and phenols, and flavonoids and alkaloid contents. The correlation analysis also revealed the significant negative correlation between temperature and phenol (-0.803), and temperature and alkaloids (-0.779). Antibacterial activities measured in term of zone of inhibition against tested bacterial strains varied in different accessions of Aloe vera. Aqueous leaf extract of Aloe vera showed good antibacterial potential against both type of bacterial strains, gram positive S. aureus as well as gram negative E. coli and S. typhi. Highland and semi-arid zone accessions showed maximum phytochemical and antibacterial potential as compared to other Aloe vera accessions. Minimum MIC value of 1.2 mg/ml was shown by Highland samples against most of the reference strains. The results also concluded that phytochemical composition of Aloe vera is influenced by various environmental factors especially temperature and it is further correlated with antimicrobial potential of the plant. Aloe vera, Climatic zones, Phytochemical screening, Antibacterial activity, MIC. Department of Genetics, M. D. University, Rohtak-124001, Haryana, India.